Note: Packaging and paper rolls sold separately. Assemble your Bulman A670 deluxe packaging table with these simple steps! Once installed, you can begin packaging with ease. This Bulman A670 deluxe packing table has everything you could possibly need for packaging or gift wrapping! The table is height adjustable from 34" - 36", so that you can customize it to fit your individual needs. It is capable of holding rolls measuring up to 32" in diameter beneath the countertop for easy accessibility. 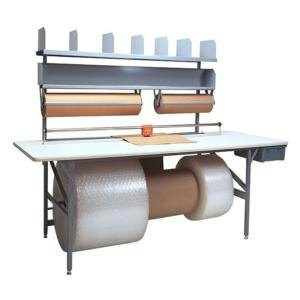 This table features two overhead shelves, perfect for out-of-the-way storage of paper, ribbon, bows, tags, envelopes and more. Keep your smaller essentials, such as writing utensils and straight edges, close at hand inside the spacious plastic drawer located just beneath the work top. Also included are dividers, a hold down device to prevent rolls from rolling back, and a built-in heavy duty dowel for roll storage and dispensing. 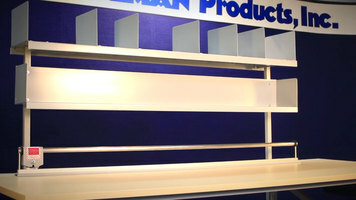 This item is compatible with Bulman's Rotary Shear Cutter, Razor-X Cutter, or A500 paper dispensers (sold separately). It's made of tubular steel framing and a composite tabletop, making it sturdy and durable.